Can you believe that 2014 is already almost over? It seems like just yesterday people were planning and attending various 2014 holiday parties and now it’s already time to start planning parties for 2015. 2015 should be a great year for parties. It marks exactly 15 years since everyone panicked over the alleged “Y2K Bug” and there seems to be no shortage of ideas and creativity to throw the best party ever. Here is everything you need to know about how to plan a party like it’s 2015. Sure, everyone’s been to the party with the Hawaiian Luau theme or the generic holiday theme, but if you want your party to truly stand out you’re going to have to get more creative. One of the key elements of great or truly unique parties is they get more specific than generic themes. Instead of a typical New Year’s Eve party why not have a flashback themed New Year’s Eve party? Share photographs and memories from previous parties and have people dress up from different decades. Or, if your party doesn’t center around a specific holiday, but rather just a spontaneous get-together of friends, try to incorporate a current trend into the event. Millennials are obsessed with mustaches and social media these days. Use mustaches for decoration and include hashtags as well. You can find mustache straws, cups, and other décor at your local party store. You can also include photos of celebrities who were famous for their mustaches — think Teddy Roosevelt or Hulk Hogan. You could even ask your guests to bring a photograph of their favorite celebrity mustache. This would be a great idea for a party to throw in March for “March Mustache Madness”. You might be tempted to try and throw a party at your own home, but let’s face it: that can be quite a hassle. When you have a party in your own home you will be limited as to how many people to invite and you’ll have to be cautious of your noise level and disrupting your neighbors. Renting a special event location for your party is a greater alternative for letting your hair down with a party outside of your home. Your options for unique party venues are limitless. Having the perfect venue for your party will help to make it memorable and can also tie into your theme very nicely. Why not take your 1920’s Great Gatsby themed party a step further by hosting it in a mansion? Or make your marine themed party come to life by hosting it in a venue by the beach or better yet — on a boat! With the help of a skilled venue specialist, finding the perfect venue for your party will be a breeze! Will you have professional catering services, or do you plan to make the food yourself? Perhaps a pot-luck would be your best option. Be sure to have some food that all of your guests can enjoy by asking them what they’d prefer to eat, or better yet, having each guest bring an appetizer to share. This would also help you to cut down on your overall costs. Many guests may have various food allergies including gluten, lemon, nuts, dairy, or chocolate. They also may be either vegetarians or vegans. Make sure you ask your guests ahead of time to indicate and special dietary needs/specifications. There’s nothing worse than going to a party and realizing you are unable to eat a majority of the food. We’ve all been to that one party where people are stuck in a room with people they barely know with nothing to talk about. Don’t let that happen at your party! Make sure your guests feel comfortable by giving them the option to bring a friend or a date. Don’t force your guests to sit at specific tables, but rather, have open seating arrangements so that guests are free to mix and mingle with whomever they choose. When it comes to games and activities, “getting to know you” or “ice breakers” are ideal. Think along the lines of “Apples to Apples” or “Headbandz”. These games always seem childish at first, but they can really help to get your guests talking and to bring their personalities out. 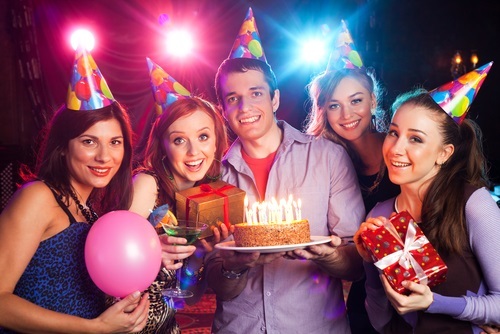 Once personalities come out to play your party will become more fun and memorable. Another activity that is becoming more and more popular at parties is photo booths. If you cannot afford to rent a professional one don’t fret….you can always set up your own. Here’s a helpful tutorial to give you some more ideas on how to make your own photo booth. There is a lot of planning that goes into throwing the perfect party. However, when you take the time to carefully consider even the slightest details in regards to the theme, location, and activities, you will have yourself a truly unique and memorable party. Now, who’s ready to party like it’s 2015? !